This is the weirdest summer ever! 103 degrees one week, 60 degrees the next. We had beautiful weather for a drive to Grinnell, Iowa to see Chuck, Nicole, and baby Colin. And despite drizzle and some rain, spending time with Emily, Jason, and Andrew in Des Moines. Memorial Day was a good time to get out of town and regroup. 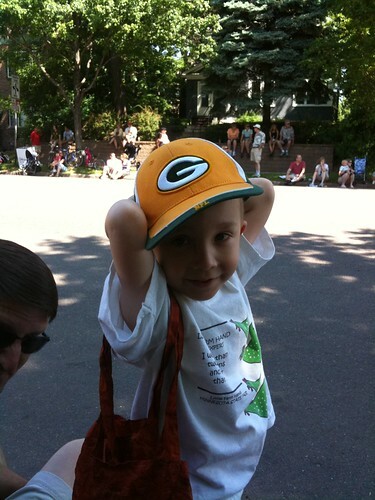 I love how Nate wears his Packers hat with pride. Someday, our kids will have similar loyalties. We spent part of last weekend in Lowertown, St. Paul at CoCo MSP for Unsummit. It was an exhausting, exhilarating day. I loved having Kevin at Unsummit a second time. He was a huge help to the conference and even attended my session. Up next, New Orleans. Laissez les bons temps rouler!